Our selection of wines by the glass is constantly changing, depending on what's new and available. The menu below is an example of our wine list, availability may differ slightly when you visit. We sell many more wines by the bottle, at the enoteca and through our wine club. 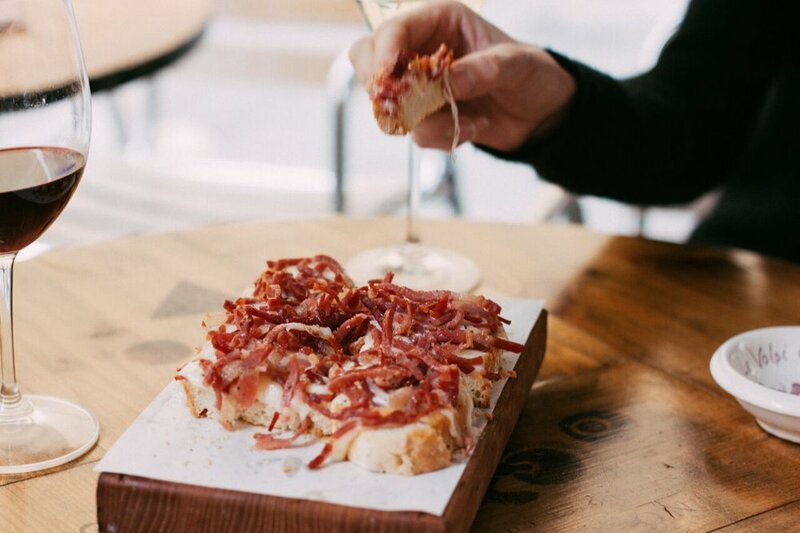 We also take great care in selecting the food we serve and we feature a number of cheeses, cured meats, and breads from small, specialty producers. We are driven by our passion for the world of wine and our desire to communicate this. There is nothing better than sharing fun and casual tastings with you so that we can pass on a bit of this passion. Guided tasting of 4 half-glasses with a selection of cheeses and cured meats for every two people. Hours: by appointment, from 11:00 to 19:00. Cost per person: € 25. By request, and prior reservation by phone, the tasting can be held in English, French, Spanish and Portuguese. Mini-tasting of 3 half-glasses, chosen on the basis of a common theme. Hours: From 11:00 to 19:00. Blind tasting of 8-10 different wines. The sommelier will guide you through an informal and fun experience, giving you nuggets of knowledge in the world of viticulture, wine making, and tasting techniques. You will also be guided in pairing selected wines with meats, cheeses, and crostone. Hours: By reservation (phone please) only, Mondays and Tuesdays at 21:30.